Is This The Most Crazy (But Delicious) Food In Perth? We’ve had our fair share of freakshakes and booze-infused doughnuts, so we’re not easily shocked when Perth restaurants and cafes break out new and insane food combinations. But when we visited The Merrywell recently we were totally gob smacked. From doughnut sandwiches and fried green tomatoes to the Rainbow Road (a dessert sprinkled with pop rocks among other things), we could almost hear our taste buds screaming with each bite of The Merrywell’s delicious food. Kicking things off with their mac and cheese bites, it was easy to see why these have become famous in Perth for their crispy-on-the-outside, cheesy-on-the-inside goodness. What we did not know is that they are coated in Doritos dust—top points to the chef because we all know how addictive Doritos are. Next it was onto the fried green tomatoes. A staple in the American south, these are unripe tomatoes that are coated in a batter and fried. The result—crispy on the outside, pillowy soft on the inside, and when dipped in the smoked ranch sauce, utterly delicious. After that, The Merrywell turned the crazy dial up a notch with their smoked brisket and chopped pork doughnut sandwich. Deliciously juicy brisket and chopped pork, smothered in smoky BBQ sauce, topped with a tangy apple slaw and sandwiched between not one, but two glazed doughnuts. WTF, right?! Well, we’re happy to report that we survived the experience AND could not get enough of this bad boy. Surprisingly, we didn’t feel too bad about ourselves afterwards either. Winning! The goodness just kept on flowing as The Merrywell crew brought out their JD glazed thick cut bacon (served with more of that tangy green apple slaw and an orange whisky chimichurri which kind of tasted like an Old Fashioned—so good), tender JD ribs in a tangy BBQ sauce served with watermelon and grilled corn and 300 grams of mini smoky BBQ ribbies (pretty much like a rack of pork belly). Even the salad was crazy, if you can really call it a salad. Charred octopus, grilled chorizo, dirty ripped potatoes and a chorizo ranch aioli—we certainly weren’t complaining! Somehow we managed to squeeze in dessert, and this is where we go from crazy to full-blown insane in the membrane. We ordered the hummingbird cake, which is pretty much a tropical carrot cake made with banana, pineapple and spices. So good! THEN, the Rainbow Road came out and our eyeballs just about jumped out of our heads. Imagine sorbet and rice crispy treats on LSD and you’re half way there. 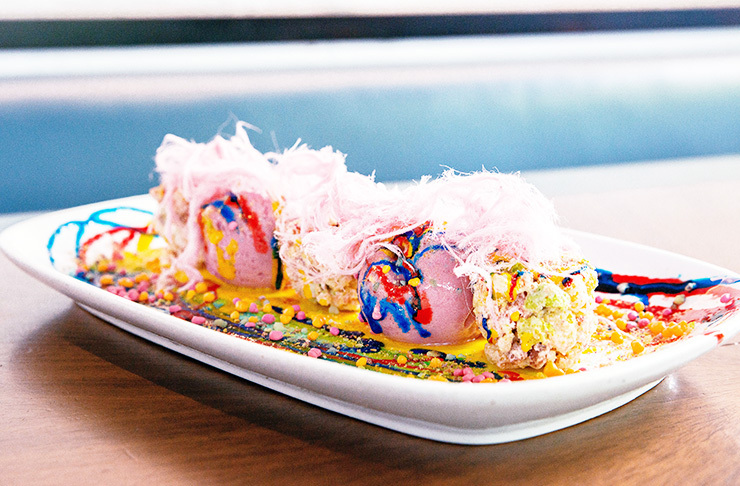 This sugar-laden sensation comprises a Fruit Loop and marshmallow treat, cherry sorbet and watermelon, sprinkled with pop rocks, Nerds and Skittle dust, then topped with fairy floss. And now we have diabetes, but it was worth it. The Merrywell, you have blown our minds and our taste buds, and we will definitely be back for more very soon! 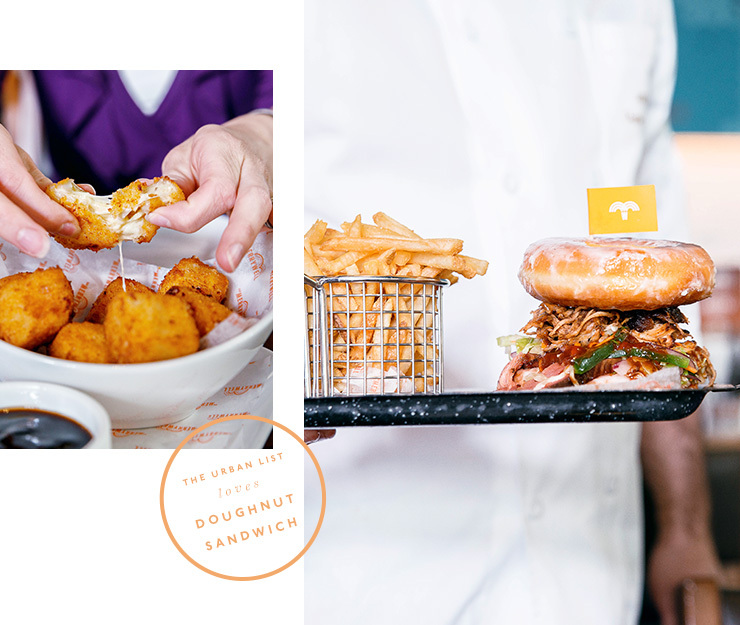 Get in quick to get your hands on the fried green tomatoes, doughnut sandwich, glazed bacon, JD ribs and the hummingbird cake, these items are part of the limited edition Jack Daniel's Barrel House menu which ends on 9 April 2017. Editor’s note: This article is proudly sponsored by The Merrywell and endorsed by The Urban List. Thank you for supporting the sponsors who make The Urban List possible. Click here for more information on our editorial policy.